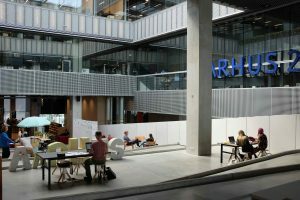 In June this year myself, Hugh Waters Research Fellow at the University of Exeter and Ciara Eastell Chief Executive of Libraries Unlimited were lucky enough to travel to Aarhus to take part in the ‘Next Library’ conference. We are working together on a joint research project focussed on social and financial value in libraries, so the conference represented our first chance to share early findings, get feedback, and make new and relevant connections with the library community across the world. The conference takes place every 2 years, is internationally significant, and gathers together leaders and innovators from many of the leading libraries around the world, including several of us from the UK. 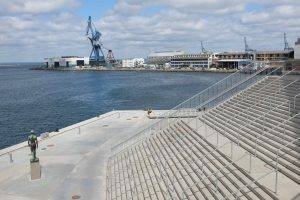 This year it took place in Aarhus, Denmark. 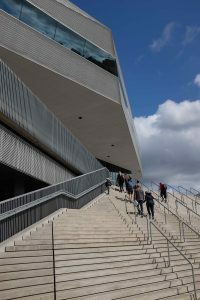 Aarhus is European City of Culture for 2017, and also proud owner of an amazing new library, Dokk1, right by the waterfront. See the pictures for a taste. The library hosted the conference, and did so brilliantly. The setting and spaces were spectacular, but the event was also managed in the warm, friendly, unruffled, relaxed and open way that Scandinavia seems to do so well. We met and heard from many inspiring people and came away with lots of new ideas and connections. Though I am passionate about libraries and their role in local communities, my own work has, to date, been more focussed on social enterprise and the wider cultural sector, so this was the first major libraries conference I had been to. I was particularly impressed by the level of thoughtful debate and attention that the librarians attending gave to their practice and craft. The conference is still giving me pause for thought, and this is the first in a couple of blogs to share some of the learning and reflections that emerged for me. If you are interested in the conference you can find out more here. All the presentations and keynotes are online and, if the opportunity presents, I would highly recommend attending in future years if you are able. This first blog reflects on some of the big picture questions that hang in the air for me, and the second is more practical. First, a bit of background. Our research is a partnership between Libraries Unlimited, the University of Exeter Business School, the Real Ideas Organisation and the Open Data Institute (Devon). Libraries Unlimited has relatively recently mutualised and ‘spun out’ of Devon County Council and, as such, is one of the first library services in the country to do so. A genuine pioneer, and driven by a desire to take the future into its own hands and seize opportunities to work in new ways during difficult and challenging times. This is a large and complex undertaking, involving change in many, many areas. What social value do libraries create and how do they do so? How can libraries connect social value to financial value in ways that amplify rather than undermine the essence of what makes a library ‘special’ in the eyes of the public? How can library leaders and managers best respond to this challenge of needing to work in more ‘socially enterprising’ ways? So, in Aarhus we were particularly interested to find ways that libraries were getting a handle on, articulating and building their social value but also approaches they were using to create new financial value too. As well as networking with others interested in and working at this ‘social enterprise’ intersection. First, I came away from Aarhus feeling like there are two diverging and very different paths, each with their own distinct qualities and characteristics. Libraries in the UK, and public services more generally, are on one of these paths. And European library services, particularly those in Scandinavia, are on the other. Our path is characterised and shaped by austerity, significant public service reform, new operating models arising as a result, Brexit, the advent of commissioning and market-based approaches rolling out in previously public spaces. With Libraries Unlimited a product of and constructive response to this backdrop. This context – like it or not – leads to change and innovation, as individuals and organisations take responsibility and respond to the opportunities and challenges that arise, establish new delivery models and organisations, and do all they can to make this all work whilst genuinely understanding, maintaining or, if at all possible, striving to enhance the social value created for citizens or ‘customers’ (depending how you want to view it), and their communities. Social enterprise exists and can thrive in this tension, as an attempt to balance, fuse and develop the best of the public sector (e.g. ethical commitment to re-channel resources for public good; commitment to that at whatever cost) with the best of the private sector (e.g. an enterprise dynamic – encapsulating far more than just money, including a desire to constantly create value for people, and a relentless ‘customer’ focus). It is worth noting, of course, that these two ‘bests’ are, of course, both theoretical. We have all encountered public sector services that are overly politicised not as focussed as they could be on creating positive value for the person in the street. Watch I, Daniel Blake. And private sector businesses who don’t exactly deliver slick, enterprising and dynamic customer service. Phone a bank or try to get a new mobile phone. But we can still aspire! And there is creativity, dynamic, complexity, challenge and opportunity on this path. The Scandinavian path is a simpler one. And there is a lot to be said for simplicity. People are prepared to pay higher taxes as part of their social contract and, in return, they receive better resourced public services, including state of the art libraries. Less impetus here, therefore, for social enterprise models. Less need too for complex and nuanced ways to understand and articulate social value in libraries – either to make more of it, to sell it to commissioners and funders, or to monetise it in diverse ways. They are simply taken to be a good and necessary thing and that is all that matters. Which path would you rather be on? This entry was posted in Uncategorized by mattlittle. Bookmark the permalink.